By using super keyword we can access super class variables and super class methods in sub class. "Super" always refers to super class object. One more interesting point about super is we can call super call constructors from sub class constructor using super keyword. By default in sub class constructor super() call will be added by jvm. We can also explicitly mention super call but rule is super() call must be first statement of the sub class constructor. 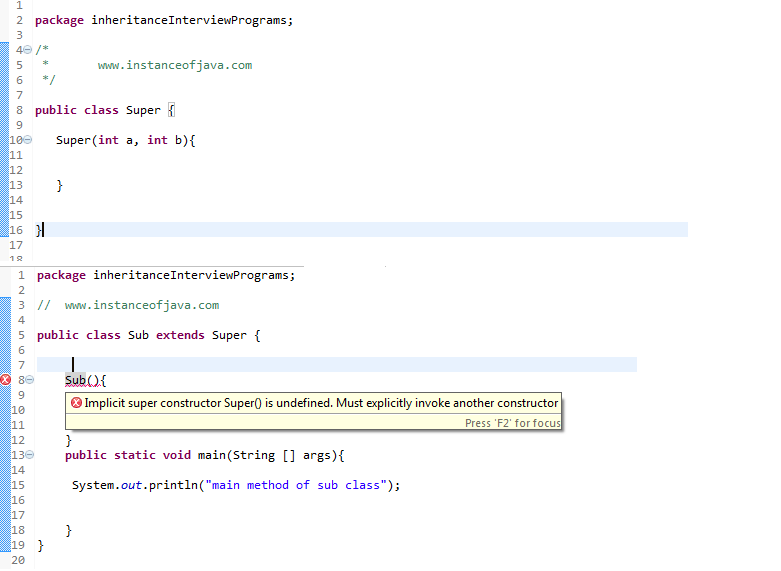 Let us see how sub class constructor calls super class constructors automatically. By default in sub class constructor super(); call will be added so now it will call super class zero argument constructor. Whenever there is no constructor in sub class then default constructor added automatically and that contains super call in it. And also when ever we define a constructor in our class .By default super(); call will be added automatically as first statement. Java example program to demonstrate super call execution from sub class constructor to super class constructor by placing super call explicitly. Super call must be first statement inside the sub class constructor otherwise compile time error will come. If super class having parameterized constructor it is mandatory to call super class constructor explicitly by passing required parameters.